Sunday 8 April is a date that I will always remember, but for all the wrong reasons. 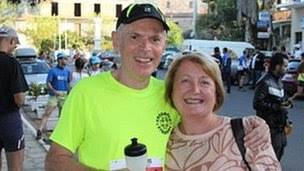 My husband John and I travelled to Greece for a holiday, but also so that John could compete in the Taygetos Challenge, a gruelling mountain marathon. John had recently retired and as an established road and fell runner, he decided to combine our love of Greece and his love of running by entering the race. He trained hard for months, often travelling to Snowdonia to train as this was similar terrain. We enjoyed a few days of relaxation and John was fit and raring to go on the morning of the race. I waved him off as he left the Greek village of Kardymili in the middle of the pack of about 100 runners. He looked happy as he waved back to me. Little did I know then that I may never see him again. I waited eagerly at the finish line and clapped the returning runners in. I started to feel a little anxious as the final few runners came in. I thought John would have been back after six hours and started to think he may be injured. If only that was the case….an injury would be nothing compared to what lay ahead. I spoke to the race organisers who were already concerned as John had checked in at Checkpoint 4 but no record of him arriving at Checkpoint 5. The nightmare that was to become my life began at that point. Everyone seemed to be asking questions and my brain was just not working. I needed to get back to our apartment because I thought he may have lost his way and returned there by a different route. The hours dragged by and the search and rescue team was called out. The weather changed. The bright sunshine turned to torrential rain and low temperatures. I was so scared. “They just need to find him quickly,” I told anyone who would listen how could he survive in a t-shirt and running shorts in this weather? I thought my heart was going to break that night. The rain was relentless and I learned the next day that the search team had to give up at 2am and start again at first light but they had not had any sight of John. The next few days are now blurred. I spent a lot of time at the headquarters for the search that had been set up in a small hotel in the mountain village of Exohori. The teams searched relentlessly but still had no clue where John could be. My son Steven arrived from UK on the first day and has been the most amazing support ever since. I could not have survived without him. He made me focus and shared the heartache. He also became the organiser. We had two helicopters to search, one with thermal imaging and Steven battled with the Foreign Office, British Embassy and MPs . After about three weeks I had a particularly bad day when I left my debit card in the cash machin.W e have all probably done that at some time but being in Greece and needing money just added to my problems and because I was feeling so down at this point I managed to trip and fall, badly damaging my ankle and smashing my mobile phone…and destroying my lifeline! I think it was at this point that Steven decided that I needed to come home for a few days and although leaving Greece was one of the hardest things I have ever done it was definitely the right thing to do at that moment. We had the support of GAIA (the voluntary search and rescue team in the area) and also had the physical and emotional support from friends and John’s brother, David, who came out to be with us at various stages of the search. Their support helped us enormously and I am forever grateful to them all. Our other main supporter was Rachel, my daughter-in-law, who became our PA and coordinated so much from home and continues to do this on a daily basis. After a week to recuperate in the UK I went back to Greece with my daughter Sara. There is little or no assistance now from the Greek authorities but we have raised money to send Cheshire search and rescue team out on two occasions so far. John’s running club Sandbach Striders have been an amazing support and three members of the club have now been out on two separate occasions to run the course and search for John. We have hired a third helicopter recently and have several hours of camera footage of the area and the local volunteer search and rescue team in Greece helps when it can, as do some of the locals. Many wonderful people have helped and supported us over the last 90 days. But the bottom line is that we have still not found John. John is the love of my life, my husband and my best friend. We have been married for 42 years and both retired in the last year so that we could fulfil all our dreams, visit all the places we still have on our list and enjoy spending time together without the stresses and pressure of our respective work lives. I still pray that by some miracle John may still be found alive but with every day that passes without any news my hopes start to fade and with it our dreams for the future. John, I just wish you could read this and know how many people have helped in some way in the search efforts… people who you have never met, new friends and friends from long ago all want you to come home safely. I love you so much and can’t imagine life without you. My gosh that is so crazy to disappear like that on a run? and he is still missing! My heart goes out to you and your family and I pray he returns to you very soon. My heart aches for you Lynda. You are such a brave woman, what a lucky man John is to have you as his wife. I pray answers come to you all very soon. Dear Lynda, Everyday I visit this site and the Facebook site, hoping and praying for news about your dear husband. I am so sorry that there is no sign of John thus far. I do have a bit of understanding of some aspects of your grief; you put one foot in front of the other each day, and you never stop missing him. When people say that your are "brave," you do not feel that way, and you probably go through the motions of life as well. 'Tis true that those supporting you anyway they are able is a great source of strength through this ordeal. My heartfelt prayers are with you and yours.